The hills towered, range upon range, behind the house with too many windows and women. These hills, with their memory of forest, of deodar, oak and pine, of rivers and waterfalls. The forests were long gone, along with deer and elephants and the men who hunted and were hunted. Now, derelict trees shivered in the wind and tried to stay upright. When it rained, they bent and swayed and disappeared in bundles carried on the heads of village women. And the hills grew bald and bleak and the famous caves could only be accessed after the rains stopped. The caves and hills had always been here – legend said – here, in this exact spot, before time began, before the heroes of the Mahabharata set up camp here, before the monks carved stone Buddhas into the hills. Pilgrims peered inside and snatched up sacred earth from the entrance and marvelled at the smell and the softness of it on their faces and wept. Barefoot men walked past each morning carrying orange flags to the shrine of the saint revered by both Hindus and Muslims. The Sahyadari Hills. Ancient. Holy. Mystical. Thirsty. And the house resisted them with its opulent gardens and many windows, immune to dust and thirst. The house with too many windows and an attic. This question is just one of many which bothers young Hannah and the first third of the novel is lush with childhood incidents that triggered her curiosity about her troublesome heritage. Narrating the story from the vantage point of adulthood, she is both amused by her younger self and dismayed by her own follies in dealing with adults who mystify her. She is too young to understand the monstrous character of the lies that surround her. But Hannah’s older brothers Clive and Warren are named after these two ‘heroes’ of the British Raj, and her father The Historian gave her much-loved older sister Gloria an English name too. Their Anglo-Indian heritage makes them misfits, as they are constantly reminded by their malevolent Maher Aunty who objects to the Indo-Persian heritage of her mother The Magician. The house is full of aunties – dervishes with their dusters and dupattas and constant chatter – but the one who troubles her most is poor mad Rani Aunty, confined to the locked attic for reasons that attract gossip which Hannah doesn’t understand. The Historian is behind all the bad things that happen in the house, but he is the patriarch and his word is law, his violence is explosive and his silences are absolute. When a man goes missing after coming to the house because something has happened to his daughter, Hannah is warned by Gloria never to speak of it. Truth, like the idea of safety in the home, is elusive. Gloria is an interesting character. The brothers are mere background, mostly indifferent to the girls and busy with their own lives in a country that gives their gender plenty of freedom. But as revealed in affectionate, sometimes droll dialogue, Gloria is fond of her little sister and their bond is close. It is as she moves into adolescence and becomes fond of a refugee from the Islamic revolution in Iran, that Hannah’s clinginess and inquisitive behaviour irritates her. The author’s decision to name the mother as The Magician is a masterstroke. For me, it evoked memories of the times my mother ‘did magic’, soothing the bumps and scrapes of childhood with magical words and small treats that emerged mysteriously from hiding spots in the house. Hannah’s mother – a strong woman but still subject to her husband’s will – uses her magic to salve childhood hurts as well, but she also does what she can to counteract The Historian’s rages, making the kitchen the heart of the house with delicious scents and storytelling. The crisis comes when Hannah is suddenly abandoned by Gloria, and by her mother and Rani Aunty at the same time. They leave with no warning, no explanation and no forwarding address. This devastating blow leaves Hannah with no one to really love her, and her sense of abandonment is exacerbated by her father’s sudden decision to migrate to Australia, a place so far away that no search is possible. Yet the move to Perth brings some consolations. The political eruptions that impacted on family life in post-Gandhi India and in neighbouring Iran are far away; life seems safe and secure in a place where the big decisions involve choosing the right suburb for property that will appreciate in value. They stay at first with an aunt and cousin who have adopted some Australian ways, and their light-hearted attitudes are balm for Hannah’s wounded soul. Patriarchs don’t fit well into the Australian social landscape, and the prospect of lovers living together before marriage (or without it altogether) turns out to be a simple matter of choice rather than a disastrous scandal. As Hannah settles into a more free and satisfying life in her adopted country, she learns to set aside the betrayals of her childhood, until a phone call from Iran takes her to the other side of the world to rescue Gloria. 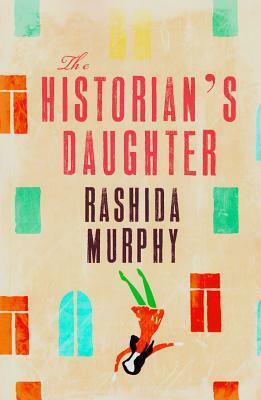 Available from Fishpond: The Historian’s Daughter and all good bookstores. Wow Lisa, I am exhausted just reading this post. The book sounds really complex. I had not heard of it before. You did a great job reviewing it. I don’t think it’s had much space in print reviews, but I found it very satisfying reading. I hovered between 3 and 4 stars at goodreads… I’m stingy with my fives because I keep them for amazing books like James Joyce’s Ulysses, so four means really good for me, and in the end I rated it four. I was actually even more impressed by the ending, but I can’t talk about that of course. Thank you Lisa. Your acute and insightful reading made me skip around the room. I treasure this. You’re welcome, Rashida:) What you may not know is that I do not write ‘nice’ reviews, only honest ones. Keep writing, please! Will recommend as I like nothing more than promoting WA women writers and there is a treasure trove of them too both past and present. And look forward to reading it soon after such a positive review. I’m so pleased you enjoyed this one, Lisa, and what an engaging, insightful review, the kind all writers appreciate. Thank *you* for the recommendation!